Our best-selling compound. Easy to use and extremely versatile. Removes medium to heavy scratches, oxidation and weathering. Diminishing abrasives round to help polish away scratches and swirls. Unlike most consumer products that simply fill scratches, Presta's Ultra Cutting Creme actually mechanically removes defects from your car, motorcycle or boat's finish. This process creates a smooth, flat and even finish with incredible gloss and shine. 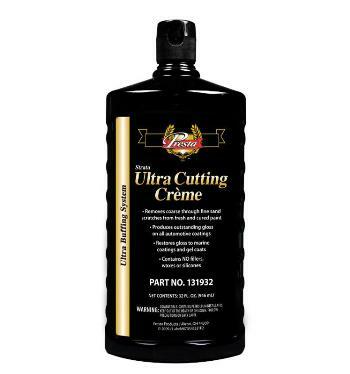 Ultra Cutting Creme's advanced formula makes compounding ultra-high solids clear faster and much easier. It's aggressive enough to remove 1200-grit (or 1500P-grit) sand scratches from soft and cured paint, yet the diminishing abrassives round out as you buff to help polish away some of the compounding scratches and swirls that other compounds leave behind. Designed for use with a high-speed, rotary buffer. 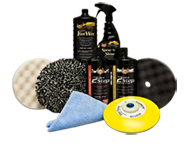 For best results use with Presta Black Wool Cutting Pad. Follow with Presta Ultra Polish to maximize gloss and shine. Cleans up easily – water-based formula. See why body shops have trusted Ultra Cutting Creme for more than two decades. Order yours today. Unbeliable product. But, I do not find it in Canada. I live in Ottawa, On. Please inform me which store in Canada can I find your product, please?